The employee journey is a working life-long journey. The customer journey is sporadic within a company. The employee journey cannot be viewed as just a series of various journeys within a company. The journey must be viewed in totality by Companies. In this article the principal focus is the employee journey and his journey (interaction with, working for) with the customer. What other factors influence the employee journey? 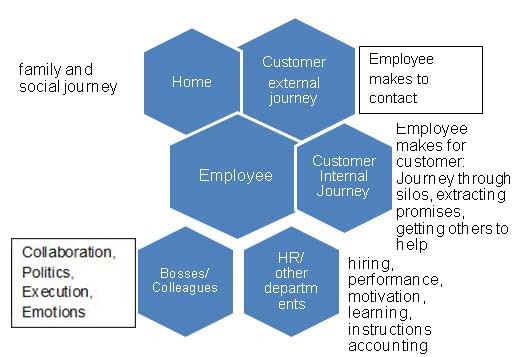 What is an employee journey? Why is it important? First and foremost, the employee is an asset, and a people asset that can appreciate or depreciate during the journey. The brand equity of the employee is seen during the journey by colleagues, peers, bosses and customers, and this brand equity impacts the brand and performance of the company. Second, only a value added employee can contribute (add value) to the company and add value to the customer. Companies can add or destroy value to the employee through this journey. If you really want to have employees perform, then the wellbeing of the employee is important. His wellbeing is impacted by his problems outside of work. The Japanese had recognised this and had tried to help the employee as a family member. I am not suggesting we do this, but we have to recognise this. How do we do this? By understanding the employee’s self-esteem that is influenced by his journey inside or outside the company. If the employee has poor self-esteem, his awareness, pro-activeness and performance is affected. So we have to look at the employee journey differently. The self-esteem can be impacted by expectations from the company, starting with expectations of his 24/7 availability by the company (your time belongs to us)… that is why companies are suggesting no email or work to be done outside the office and office hours. There is yet another journey that the employee makes, of self-improvement. Many companies can help and do help. The next journey is the journey in interacting with the customer externally and internally in helping him navigate the company. Very often his journey is thwarted by silos, by rules, by regulations and thou shalt or shall not do this. So he prefers to not take the journey in its entirety and leaves the customer stranded. He needs help in this journey. The silos, hierarchy, rules can cause a frustration during the journey. Then is the journey with his colleagues and his bosses, and in office politics. Should he appear honest or loyal? A much wider employee mapping is necessary to know his needs and to make his journey well worth it. This entry was posted on August 8, 2014 at 6:08 am and is filed under Business & Management. You can subscribe via RSS 2.0 feed to this post's comments.